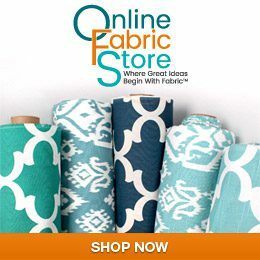 Browse: Home » Can You Create Clothing with Home Decor Fabric? Can You Create Clothing with Home Decor Fabric? When I post photos of fabric on our Facebook page or Instagram, our OFS community usually leaves a pretty wide array of comments. You know, one might say “That’d be awesome for a quilt” while another says, “Perfect for a handbag.” I love all the comments and that people take the time to engage with us. But sometimes I think to myself, actually, this [fill in the blank] fabric wasn’t really meant for that. Because certain types of fabric serve a certain purpose — upholstery fabric is heavy so it can work for upholstery projects, apparel fabric gives or is light for making clothing, and so on. A while back I posted this Waverly Lotus Lake Porcelain fabric on Instagram. It’s a home decor fabric made of 100% cotton chintz, and is mostly meant for drapery, throw pillows and maybe light-use upholstery needs. And well…she was right! Except I think it’d be lovely to wear in the fall, winter and spring too! Have you ever made something out of a fabric intended for a different purpose than what you were making with it? Get more looks of Liz’s decor fabric pencil skirt here. I think its absolutely gorgeous. I have made some kaftans with light drapery fabric. How would it be properly laundered? That’s what I thought. One is worth paying to clean… The other not so much lol. If the curtains in the Sound of Music were made into clothes for the Von Trapp children, it shows that you CAN cross-purpose fabric! I do it all the time. Currently, I just finished a very comfortable “baby doll” style dress out of 100% cotton Waverly fabric. It looks and feels cool and great.